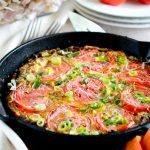 Today, I’ m sharing with you another healthy filling breakfast recipe – potato, ham and tomato frittata. Happy 4th of July to all my American readers! Hope your weekend is enjoyable, safe and relaxing! While this breakfast may be enough to feed 7-8 people, it doesn’t take very long to make. It comes together in about 15 minutes. I love to make frittatas when I know that I have a busy Saturday ahead of me and they keep me full until lunch. 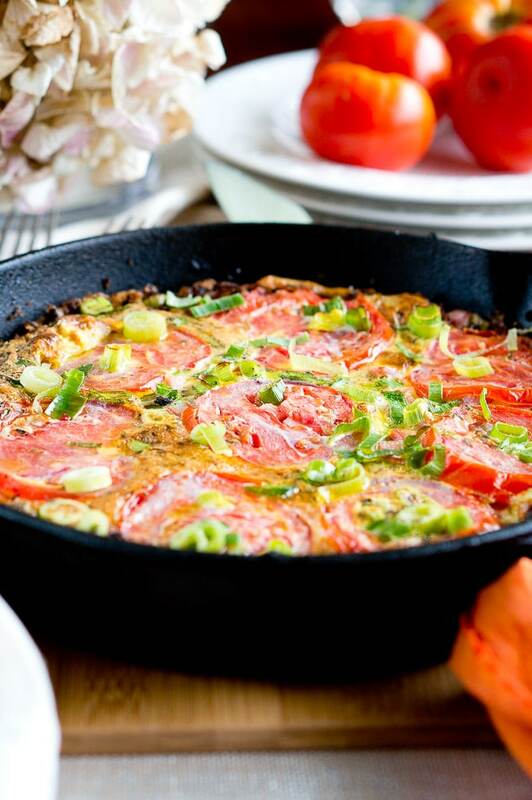 Back to this delicious potato, ham and tomato frittata. The thinly sliced potatoes serve as a thin crust at the bottom of the frittata. They are topped with ham and thin slices of tomatoes. And the eggs serve as a binder between the potatoes and the tomatoes & ham. Frittatas are so good and filling, sometimes I even eat them for lunch. Heat the oil in an 8- to 10-inch skillet (I used cast iron skillet) until hot but not smoking. Add the potatoes and cook, covered, for about 10 minutes, stirring occasionally to brown on all sides. Add the chopped onion to the skillet, mix with potatoes and cook for 1-2 minutes. Add the diced ham on top. Preheat the broiler. Meanwhile, break the eggs into a bowl. Add the green onions, salt, and pepper and mix with a fork. Add the egg mixture to the skillet and stir gently with a fork for about 1 minute so the eggs flow between the potatoes. Add tomato slices to the skillet, arranging them so they cover most of the frittata. Cover and cook for 1 minute. Slide the skillet under the broiler, 3 to 4 inches from the heat, and cook for about 3 minutes, until the eggs are set. Slide onto a plate, cut into wedges, and serve. 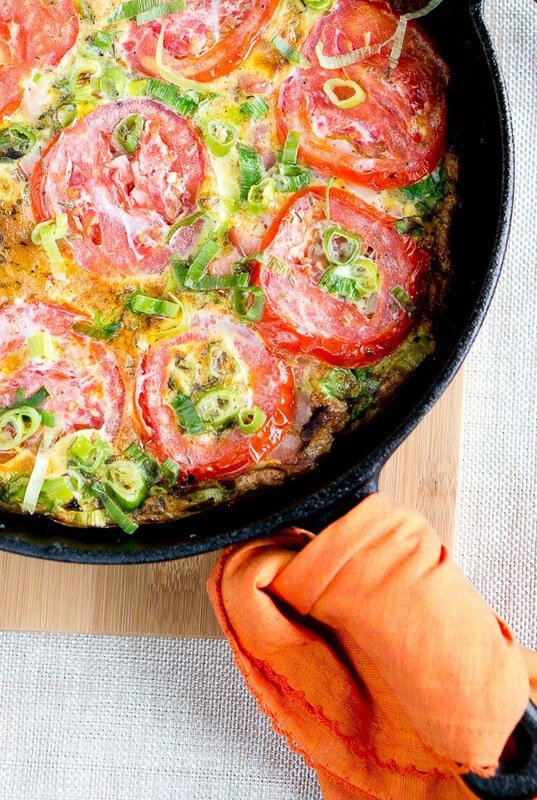 Easy Potato, Ham and Tomato Frittata - Ready in minutes and healthy! Perfect for any meal!! Great for using up odds-and-ends veggies, too! Great for brunch! Preheat the broiler. Meanwhile, break the eggs into a bowl. Add the chives, salt, and pepper and mix with a fork. Add the egg mixture to the skillet and stir gently with a fork for about 1 minute so the eggs flow between the potatoes. Add the tomato slices to the skillet, arranging them so they cover most of the frittata. Cover and cook for 1 minute. Hi! I just published a post on Buzzfeed community compiling 8 savory breakfast recipes–including yours for a Potato, ham, and egg fritatta. 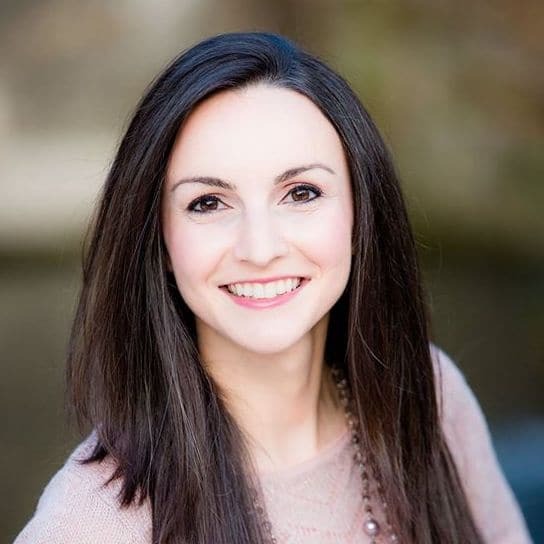 I used one photo, and followed the sharing guidelines you specified. If you want to check out the post, it’s here: https://www.buzzfeed.com/breakfastbylisa/8-delicious-savory-breakfasts-2gvtz. I hope that’s all okay with you, but if not, please let me know so I can take it down! Ohhh nice!! I made a quiche with potatoes and ham for my husband the other day, cause I don’t eat a whole lot of meat usually. he loved the addition of potatoes and I imagine how delicious they must be here in this frittata also!! I am starving this morning and this recipe looks to die for. One of my favorite brunch items. I also love all the information on the recipe card. I am printing this out ASAP! 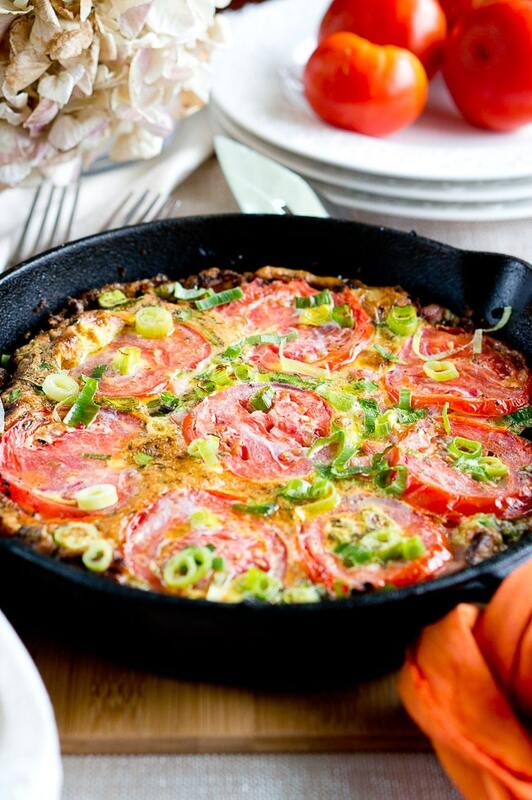 BTW your photos look amazing and really makes the potato, ham and tomato frittata stand out. 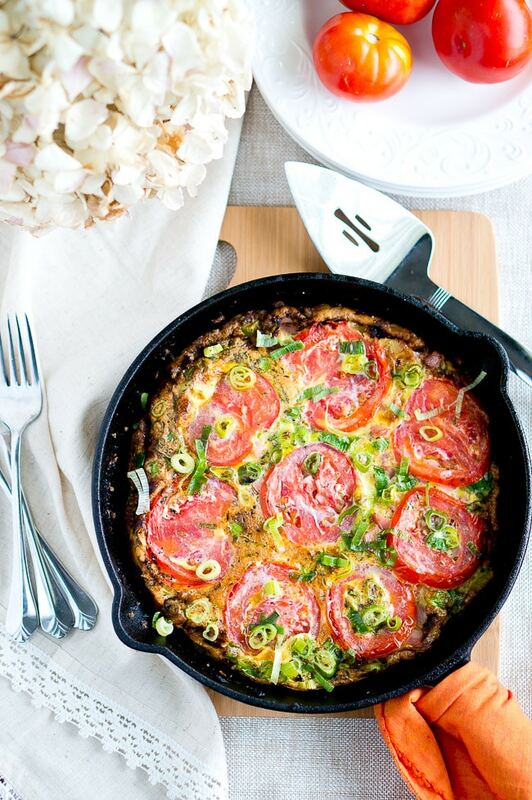 wow this is one heck of a gorgeous frittata. I love them and we make something similar but never this decadent and pretty! Wow! 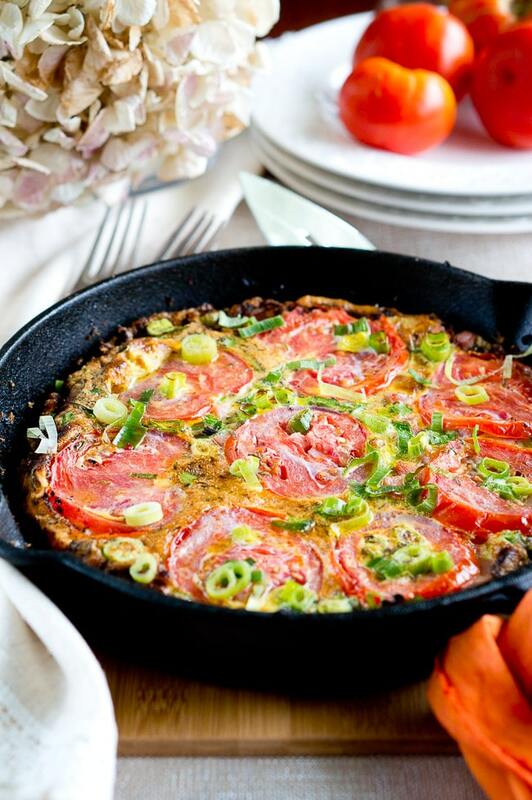 This Frittata looks gorgeous! I’ve never tried one, but I see a lot of people make them. Definitely on my last of things to try! Yum! this is right up our alley we love frittata and this one has everyone in it we love. I really love tomatoes in it! Wowza! I love a good frittata and yours is absolutely gorgeous. I’m gonna try it this weekend with a salad for dinner. I’ve not made a frittata for years, I’d forgotten how good they could be. You have inspired me to try one again. Looks like a wonderful way to start the day! And that it’s dairy, gluten and nut free, and Whole30 compliant. YUM. Oh how I dream of homegrown tomatoes! We have managed to grow a few and they were the best tomatoes ever, but our northern facing garden in London is just not the place for it. This frittata looks incredible! All those gorgeous colours and those juicy tomatoes. Yum! This is such a beautiful and filling weekend breakfast. Perfect start of the day! I can’t wait to make this! This would be a great summer dish and a delicious way to use up all those tomatoes. It’s been absolutely forever since I’ve had a frittata, and I’ve never tried making it at home before as it seemed difficult. You make this sound so easy to do! My mouth was watering before I even read the ingredient list! I can’t wit to make this for brunch this weekend!